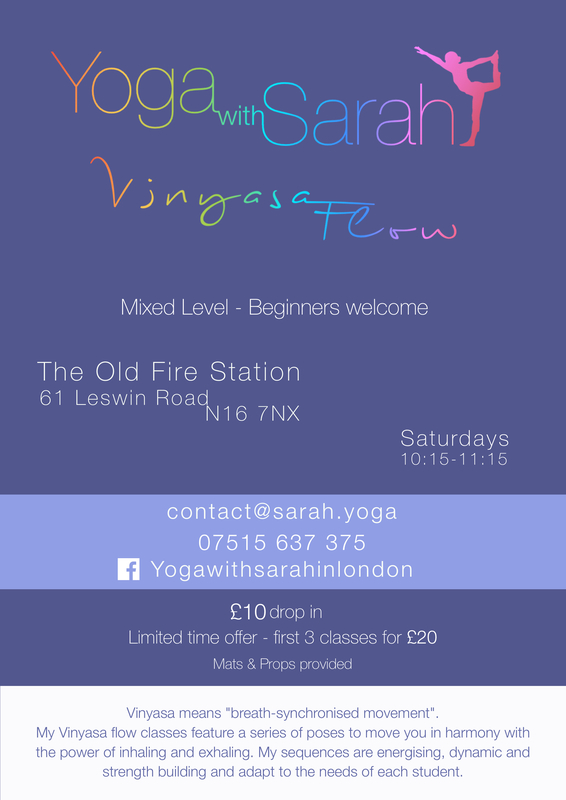 Yoga with Sarah – new Vinyasa Flow Yoga classes – intro offer first 3 classes for only £20. The Old Fire Station has become quite a hub for yoga these days. The site hosts a range of classes in different yoga styles Monday through Saturday. The newest addition is my Vinyasa Flow class on Saturday mornings from 10:15 – 11:15. Prices are £10 drop in, and I have an introductory offer valid throughout March and April where students can get their first 3 classes for £20. I hear from many people that sometimes all the different styles of yoga can be confusing and they’re not sure which is right for them! So let me tell you a bit about Vinyasa Flow and what you can expect from a typical class. Vinyasa means ‘breath-synchronised movement’ and therefore the key feature of Vinyasa flow classes is that the series of poses is built to move you in harmony with the power of inhaling and exhaling. Additionally, the ‘flow’ element means that one posture links easily and naturally to the next, encouraging an ability to move into deeper postures. Like all styles of yoga, Vinyasa Flow has both mental and physical benefits…physically, the classes are a great full body workout which will tone, lengthen and strengthen your muscles, whilst improving mobility in the joints. Mentally, the synchonised breathing helps to relax and calm the mind. Vinyasa Flow classes are suitable for beginners – they can be a great starting point to get familiar with yoga. And for more advanced students there will always be ways to continue challenging yourself! For me as a teacher it’s also really important to focus on alignment, so I ensure that plenty of instruction and supervision is given to all students to ensure they’re doing a pose safely and effectively. I have a friendly and supportive teaching style and my classes are suitable for all levels, with modifications offered for a range of abilities. Feel free to drop into my class, or get in touch via email or phone if you’d like more information.